Married at First Sight: Happily Ever After’s Ashley Petta revealed the gender of her baby to Anthony D’Amico against his wishes. It’s clear that Ashley still has issues with control. She takes it upon herself to surprise her husband with an unwanted gender reveal. Things start off on a happy note this week on Married at First Sight: Happily Ever After for Anthony D’Amico and Ashley Petta. They come back from their couples retreat and decide to sit down together. They each have gifts to present to celebrate their anniversary. Anthony goes first, giving Ashley a package of spa treatments from now until their baby arrives. This is very thoughtful of Anthony D’Amico. He took note of Ashley complaining that her back hurts and hopes that this gift will solve some of those problems for her. Things don’t go so smoothly for Ashley Petta when it’s time to present her gift on MAFS: Happily Ever After. Anthony D’Amico opens the box to find a shirt for a baby girl. The look on his face in this moment says it all. He explicitly did not want to know the gender of the baby yet. While he does eventually accept this, this perfectly illustrates one of the glaring issues in their relationship. Ashley calls all the shots and decides what’s best without taking Anthony’s preferences into account. It may seem like a small thing but there is definitely a pattern on Married at First Sight: Happily Ever After. 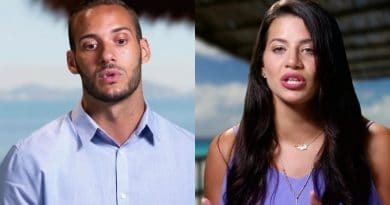 It was obvious in last week’s episode of Married at First Sight: Happily Ever After that Ashley Petta has some significant control issues. This is made even more obvious by Anthony’s demeanor. It’s clear that Ashley wears the pants in this relationship. On top of all this, Anthony D’Amico can hardly get a word in edgewise. While this was plain to see last week, it was just as clear in this week’s episode as well. Even though Anthony D’Amico would have found out the gender of the baby eventually, that’s not the point. Ashley Petta completely disregards his wishes and decides that he is going to find out on her terms. While Anthony does accept this decision eventually, he’s still struggling to find his voice. Ashley is a take-charge personality while Anthony is much more reserved. If he doesn’t find his footing, he’s going to continue to get bulldozed by Ashley. This is something to keep an eye on in Married at First Sight: Happily Ever After. 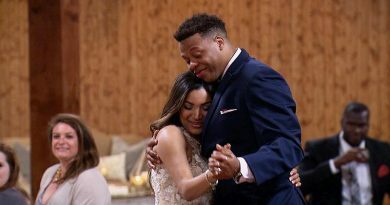 One of the biggest questions for this Married at First Sight: Happily Ever After couple is how they’re going to raise their newborn when she comes. If Anthony D’Amico doesn’t find his footing soon, it’s very likely that Ashley will call all the shots when it comes to raising their child too. In this regard, Anthony could end up parenting from the passenger’s seat rather than from behind the wheel with his own ideas and views. While they want to be on the same page when it comes to raising their child, right now it looks like it’s going to be a page from Ashley Petta’s book. Hopefully, Anthony will be able to write a few chapters of his own.